Rooftops are a clever little band. Their debut album, A Forest of Polarity, contains song titles all comprised of the same letters — a nice and quirkly little trick that fits well on the nice and quirky little album. Although it is not particularly original, the band does a nice job of mixing light-hearted guitar tones ala Minus the Bear with the math/proggy-rock of Maps And Atlases. The result is rather pleasing. The band truly wears their influences on their sleeves. “Astray Life” sounds like it was taken right from Maps And Atlases’ latest album, a quick, guitar noodling affair that is almost over before it even starts. This tone carries over into “I Fast Early,” which draws more from the Minus the Bear page — if Minus The Bear were way more interesting musically. 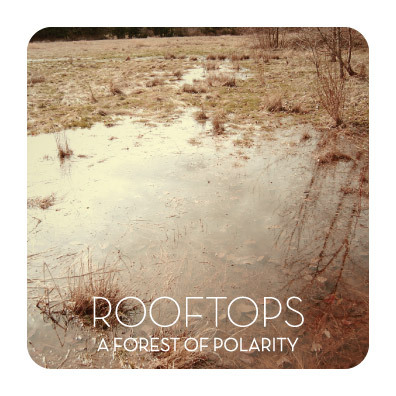 Because even though A Forest Of Polarity sounds like it’s ripped straight from the headlines pretty often, Rooftops do a good job of putting their own flavor into the mix. “I Fast Early” shares those proggy moments and those little noodling sounds, but then the band breaks down into a gentle melody, only to quickly blast right back into the heavy drum beats and mathy tones. “Raft Easily,” with its chanting vocals echoing over quick tribal beats, pulls the band away from the instrumental zone. The band leaves with great guitar melodies that, in their own right, pay homage to the finger-picking of Dave Knudson of Minus The Bear. This time around, though, Rooftops use a repetitive, almost post-rockish mentality to let it echo and echo, build and build, before bringing in sudden, jarring math rock changes.